Four Star Solar PV Centers combine photovoltaic control of large solar systems into a single, compact, easy-to-use unit. These PV Centers are pre-wired with American-made Midnite Classics from Midnite Solar, the best solar charge controllers on the market. 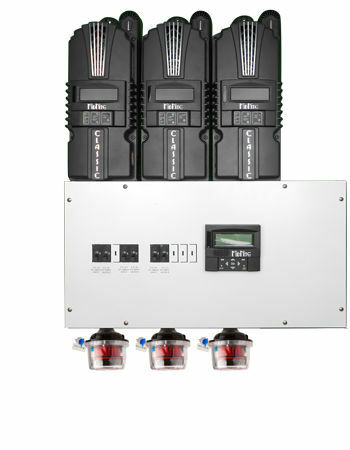 The Midnite Classics include Ground-fault protection and Arc-fault protection in each controller ensuring a code-compliant, safe and easy-to-monitor solar system control. The Classic controller display gives you up to the minute information on how your solar system is performing. This pre-wired unit saves you or your electrician hours of wiring time by combining all solar control into one box. Attach your solar panels and batteries and you are ready to go. These units are designed to stack easily with each other, so you can add as many as you need.